He was an Ashramite Sadhak for almost 50 years falls on 18th June 2012. Vijay Bondse or Vijukaka as I used to call him was my father’s cousin. He was born on 3rd May 1933 in Girgaum, Mumbai. He got his school education in Ram Mohan High school (Prarthana Samaj). And then he completed MSc in Mathematics from Wilson College. He was a voracious reader from schooldays. He had read quite a lot from Marathi and English literature but always liked the pieces with a touch of philosophy, mysticism and humour. He was fond of Indian classical music and had tried on sitar for some time. This liking was obviously inherited from the family. 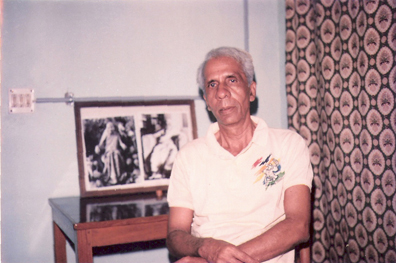 His uncle Vasantrao Bondse was the pioneer of famous Trinity Club of Girgaum. His elder sister Indumati Bondse, A devotee of the Mother, was “A“ grade classical singer on All India Radio, Mumbai. Vijukaka was also a great lover of sports particularly Cricket. His knowledge of scientific play of cricket was so acute that once after reading his comments my son, Geetesh, said that Vijukaka could have become a great sports journalist. Sometime after the college life was over he came across some books on Sri Aurobindo and the Ashram, given to him by one of his class-mates Sri Ramakant Navelkar. These two friends started their pilgrimage and went to Churchgate Center where, according to Sri Navelkar, Vijay felt deep descent of Peace. Then, when they went to Pondicherry together in 1961 Vijaybhai met Kiritbhai and expressed his desire to join the Ashram. After the Mother’s approval he joined the Ashram in 1963 and his friend Sri Ramakant Navelkar joined in 1965. Thus these two schoolmates became co-sadhaks in the Ashram. Even on that fateful day they were together and going to a place . Vijay taught Mathematics and Marathi in the Sri Aurobindo International Center of Education from 1963 till he breathed his last on 18th June 2011. He was a sincere and dedicated follower of Sri Aurobindo and Sri Mataji and always tried to perform the job, honestly and sincerely, assigned to him by the Mother. He was a very silent person, normally appeared to be engrossed in some thought as an absentminded professor. At least four articles written by him in 1995/96, which I have seen, for Mother India: The Pursuit of Agni and Soma; Aum, the Mystic Syllable; Indian Temples and Man, the Embodied Soul; Shiva & the Myth of Phallus Worship; these are indicative of his scholarly pursuits. He has written some poems in English, two of which are given in the attachment. He has also written an article in Marathi Sanjeevan on Integral Yoga. In addition to this he had also translated Hound of Heaven byFrancis Thompson into Marathi as Divya Shikari. He was also very much interested in politics, National and International, in reference to social progress of Humanity and had written a very nice note in a letter to me on Social Philosophy of Sri Aurobindo. In our family we two were quite close to each other. In fact even if I called him as Vijukaka we were good friends and I looked to him as my “Friend, Philosopher and Guide“. It was a great pleasure to talk to him or read his educative and thought-provoking letters written in a very nice handwriting. It is very difficult to express the loss I feel now. But that is God’s wish. His soul must have rested in peace in the lap of the Mother. All my family members join me to salute this holy soul because of whom we have been able to walk a few steps on this spiritual path and get blessings of Sri Aurobindo and Sri Mataji. And be the master of his nature and his fate. He came down bathed in mute eternal hush.